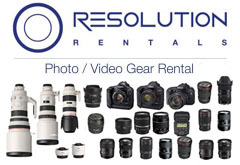 Photography by Howard German except where noted. 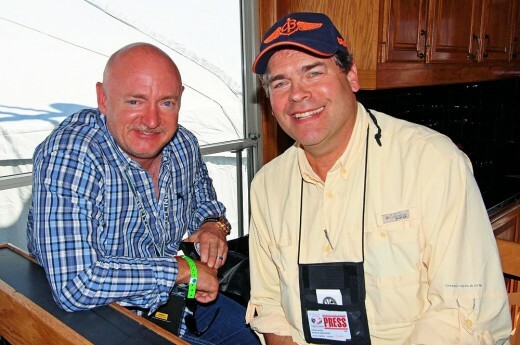 Written by Ken Kula with Shirl Kula. 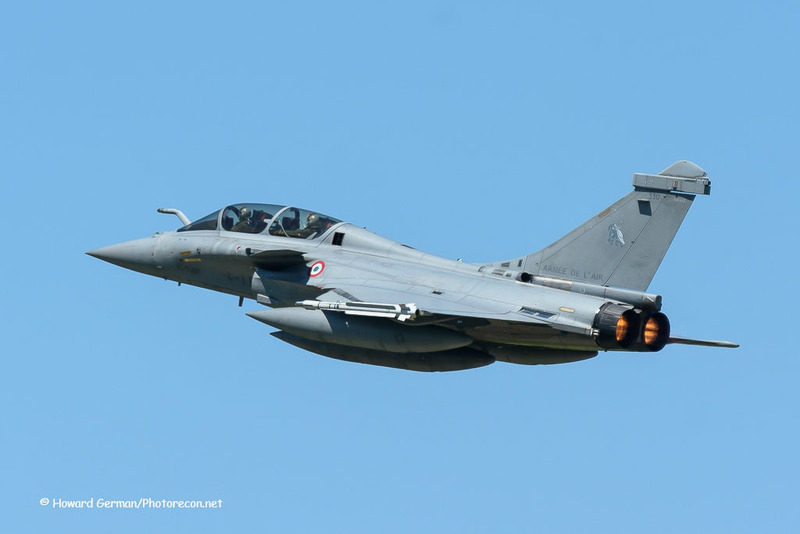 The Armee de l’Air sent Dassault Rafale jet fighters, split between the single-seat Rafale-C and twin-seat Rafale-B versions. 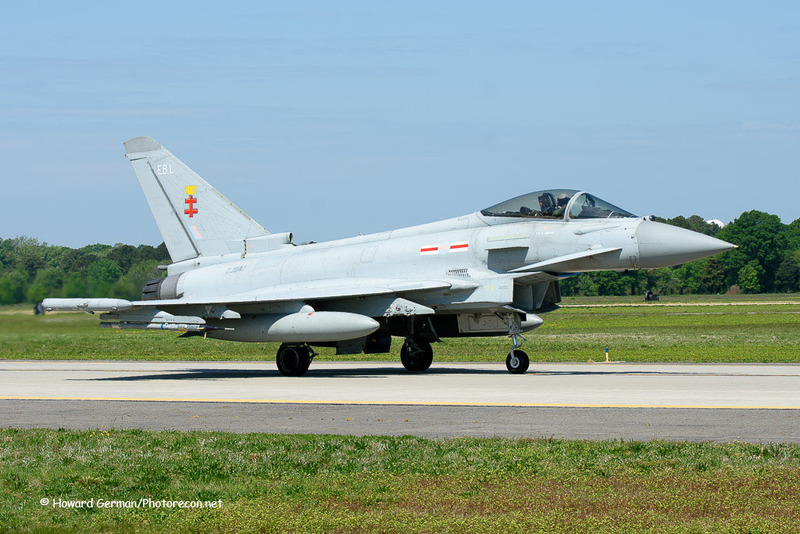 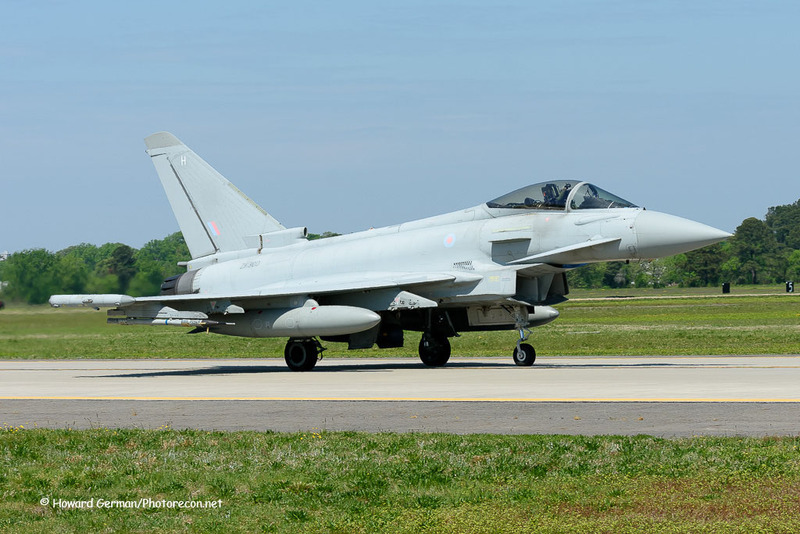 The U.K.’s Royal Air Force sent a group of Eurofighter Typhoon FGR.4s. 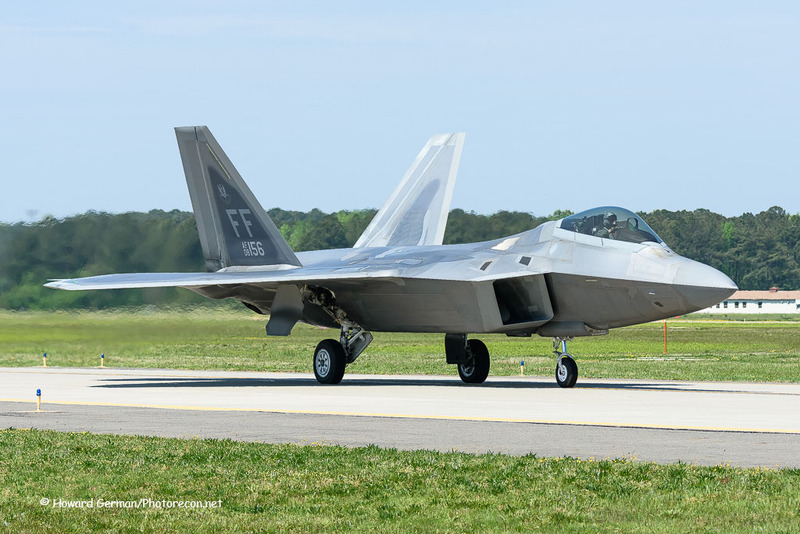 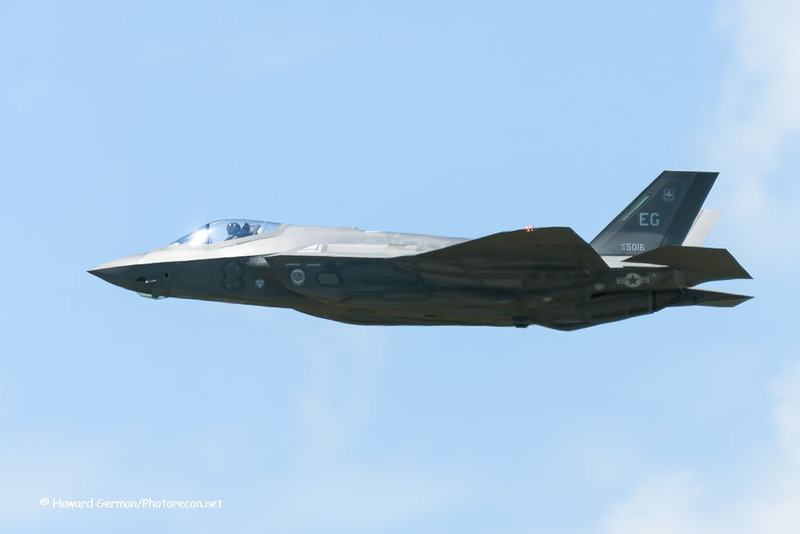 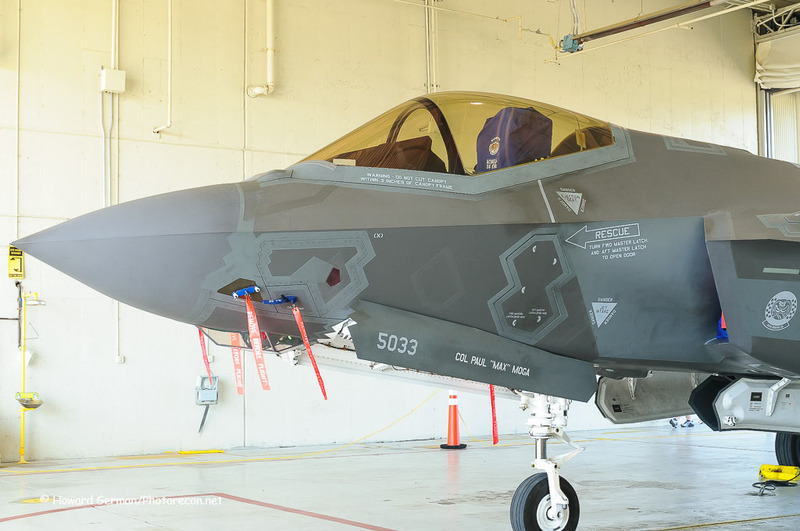 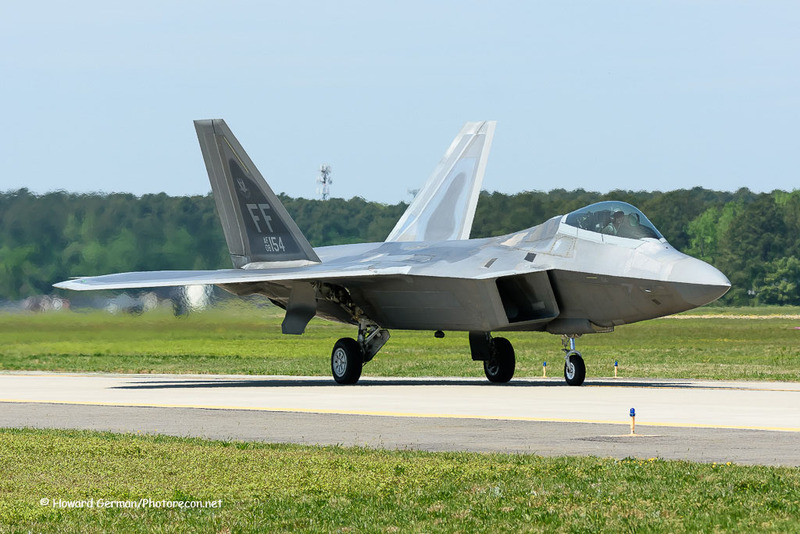 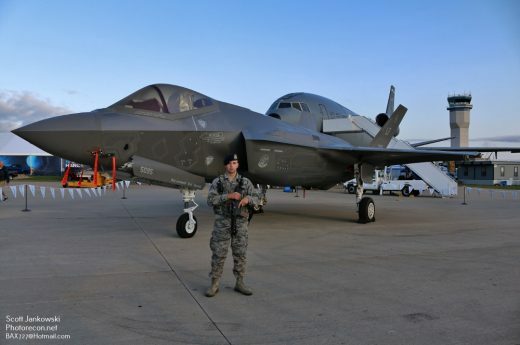 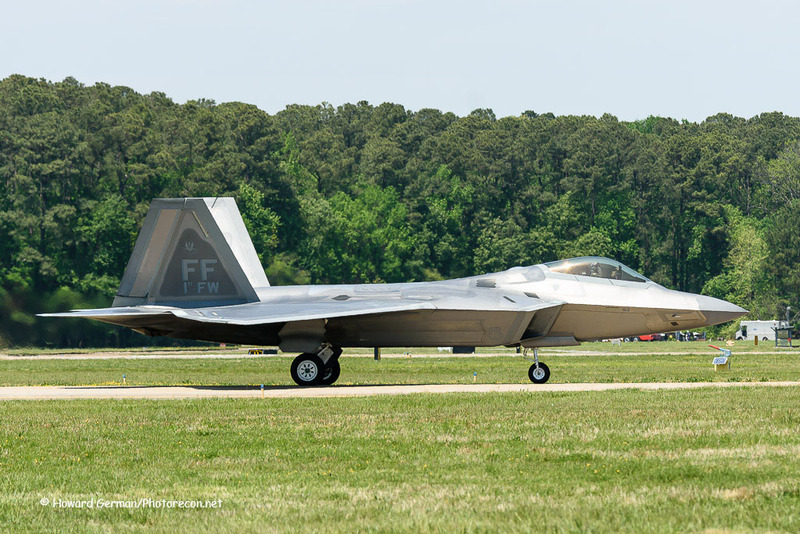 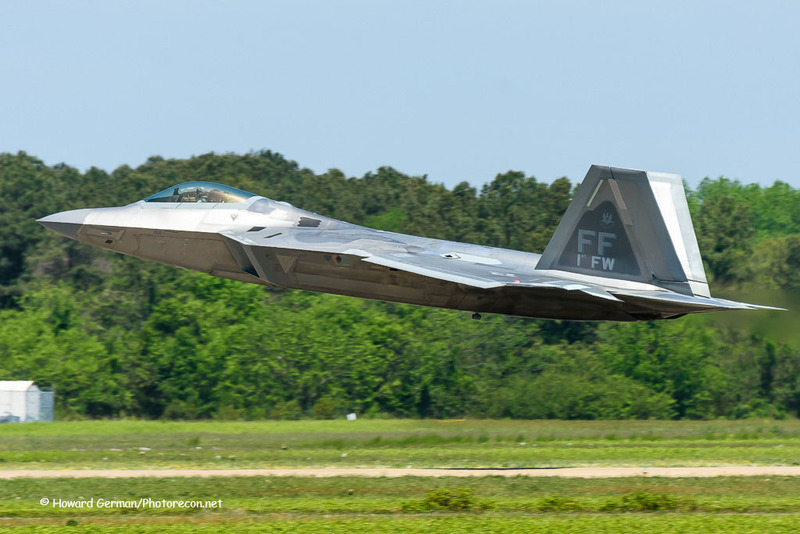 The U.S. Air Force offered its latest platforms for integration during the exercise, including home-based F-22A Raptors from the 1st Fighter Wing and F-35As from the 33rd Fighter Wing. 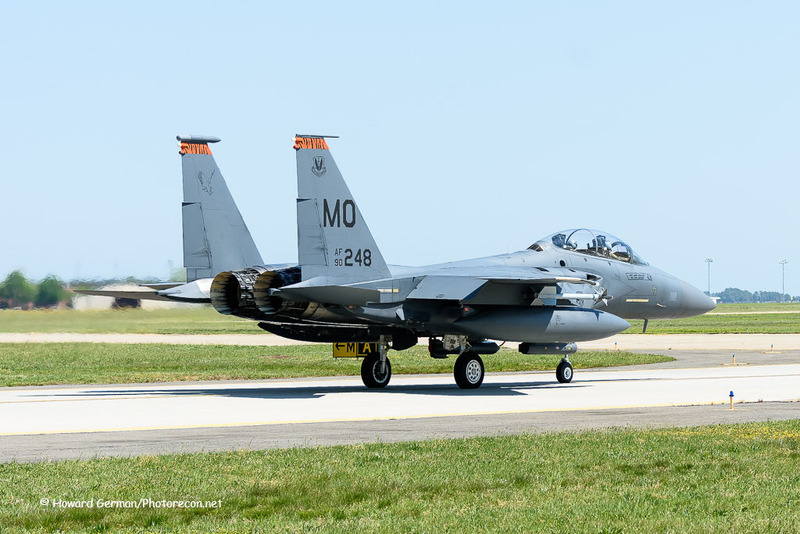 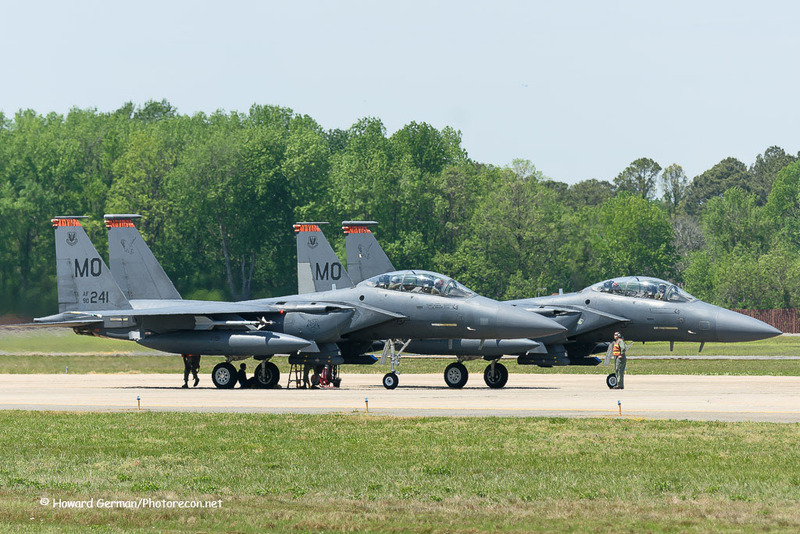 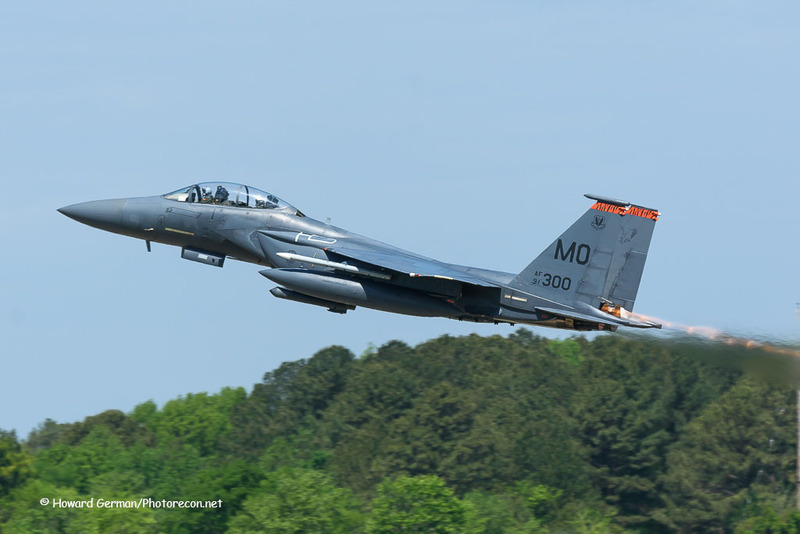 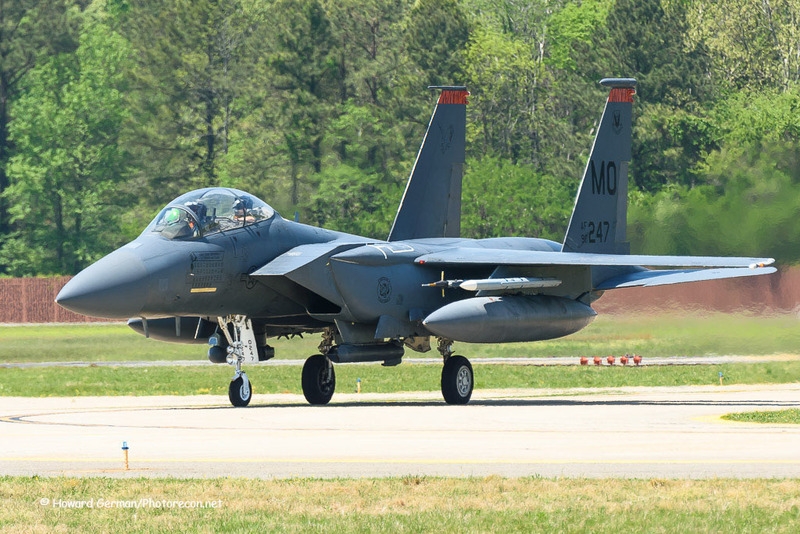 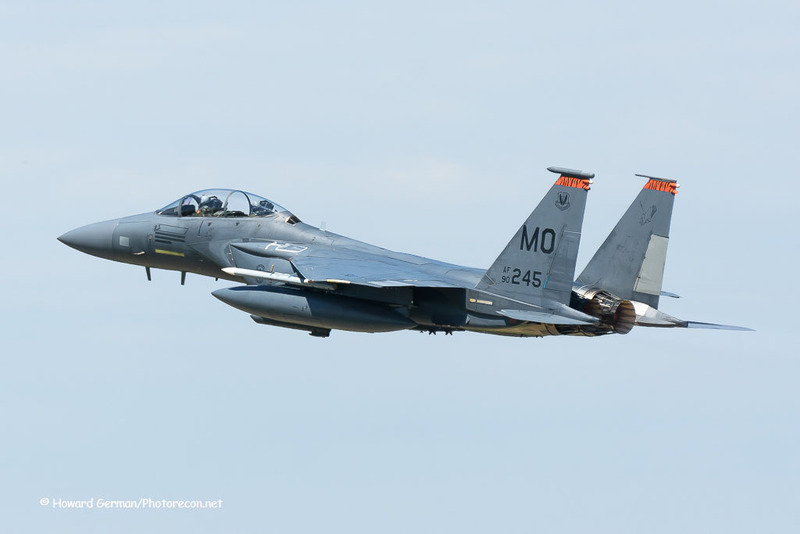 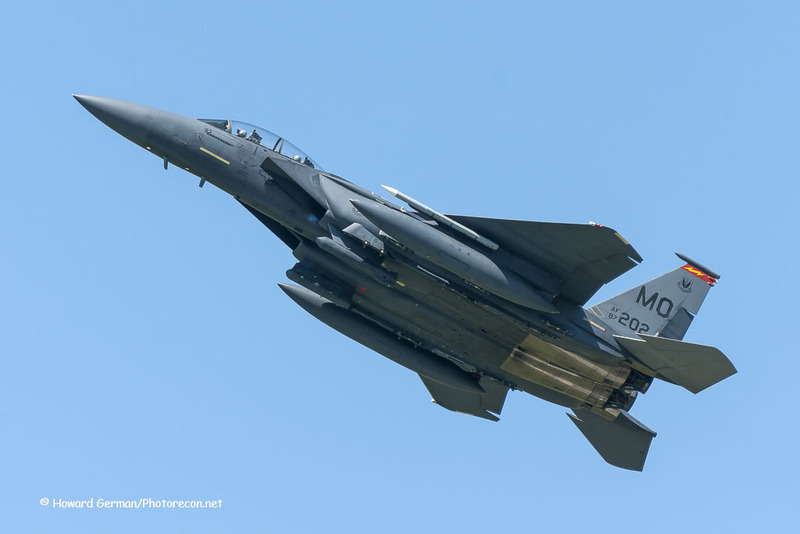 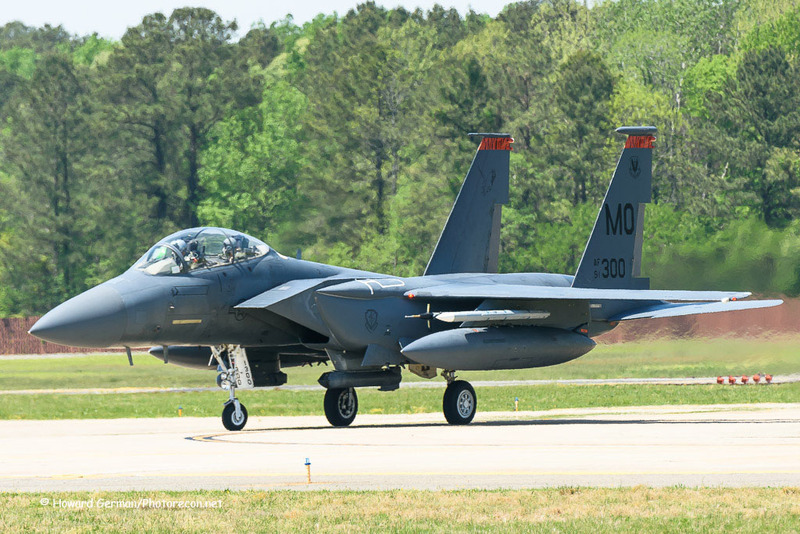 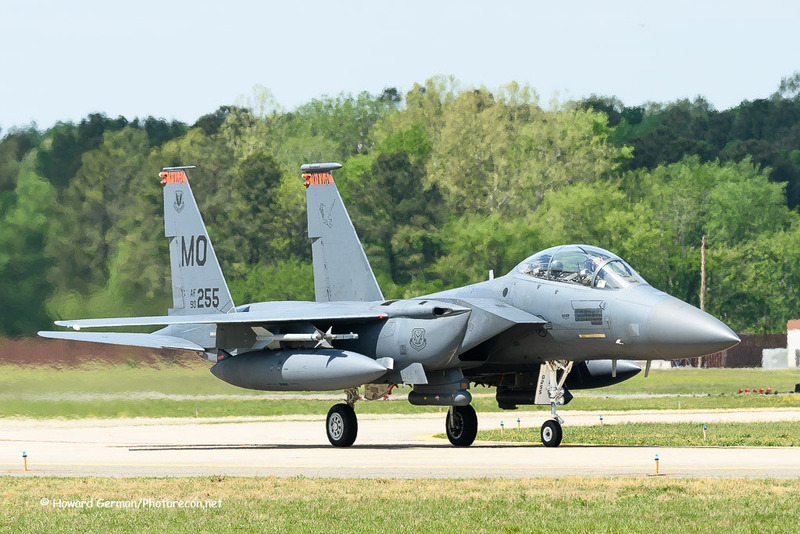 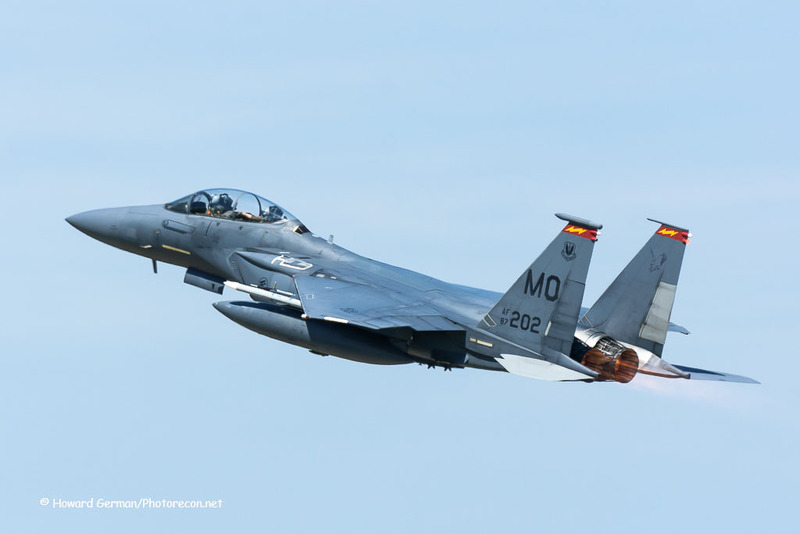 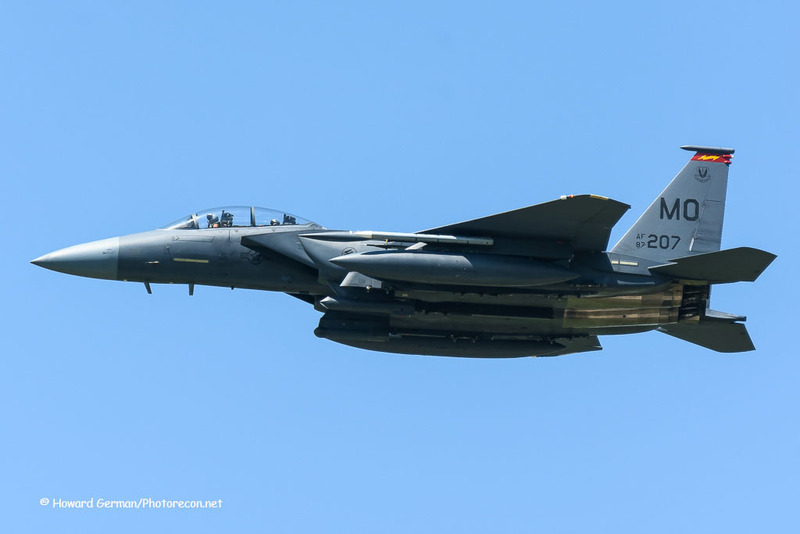 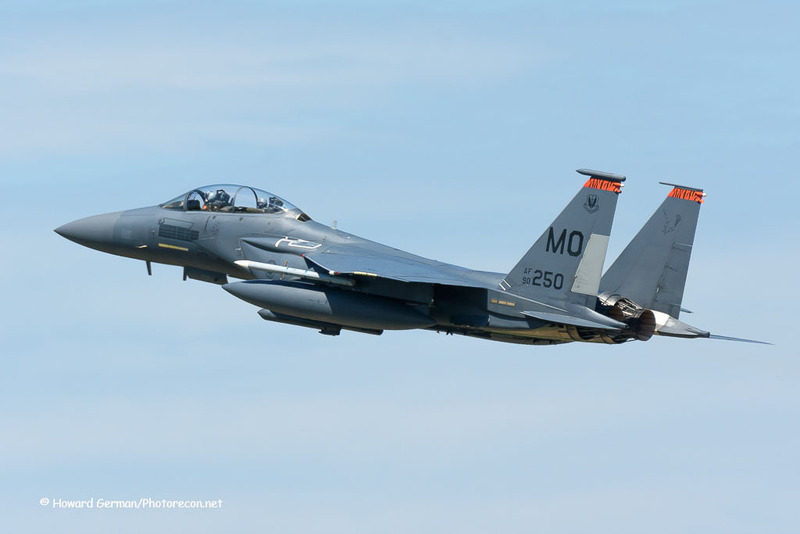 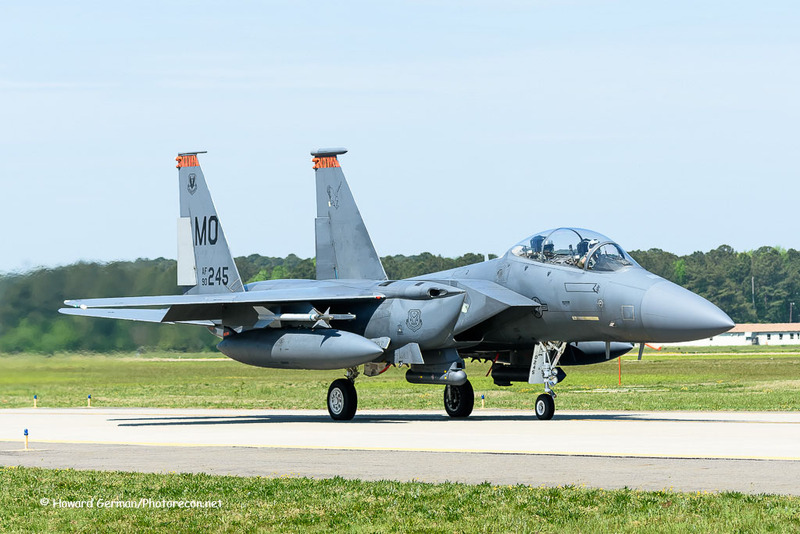 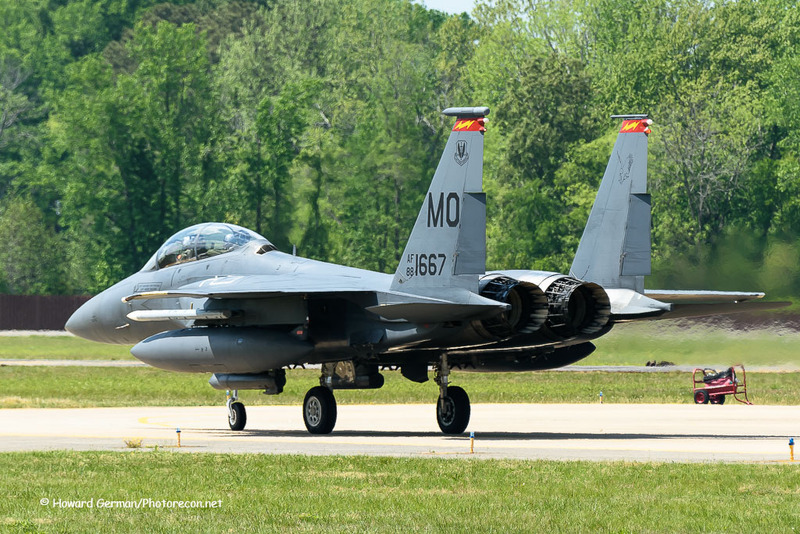 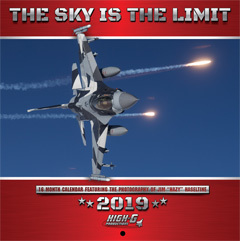 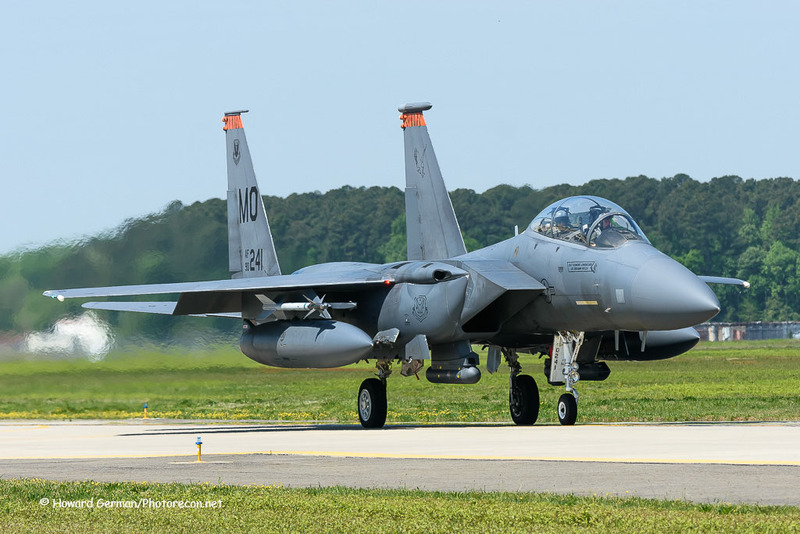 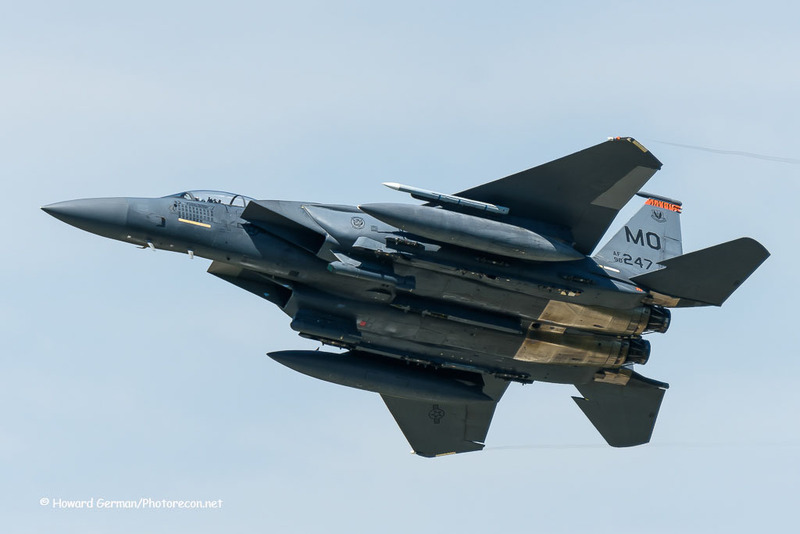 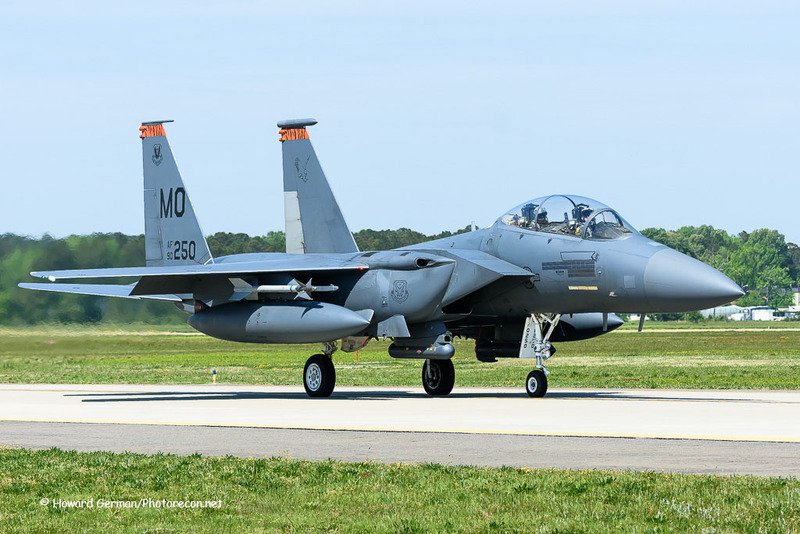 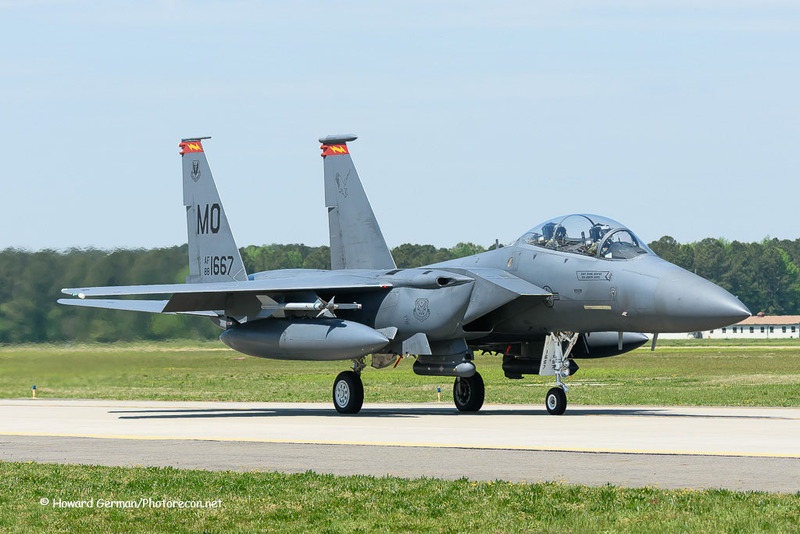 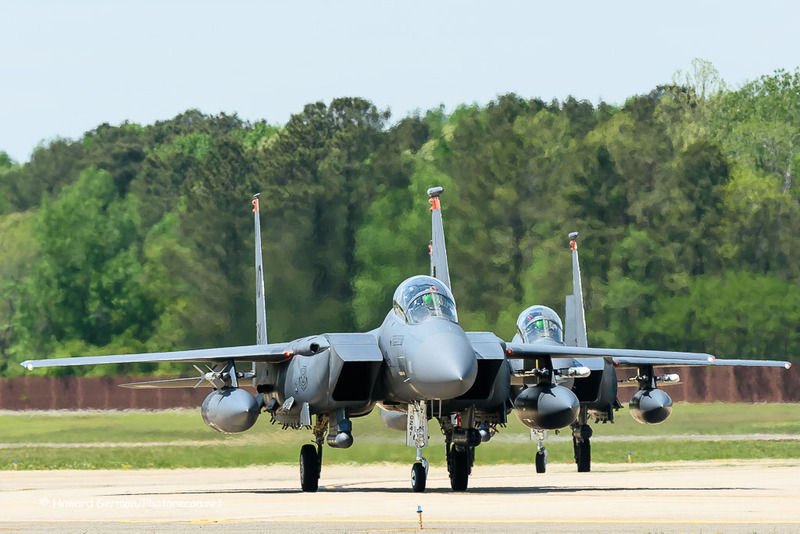 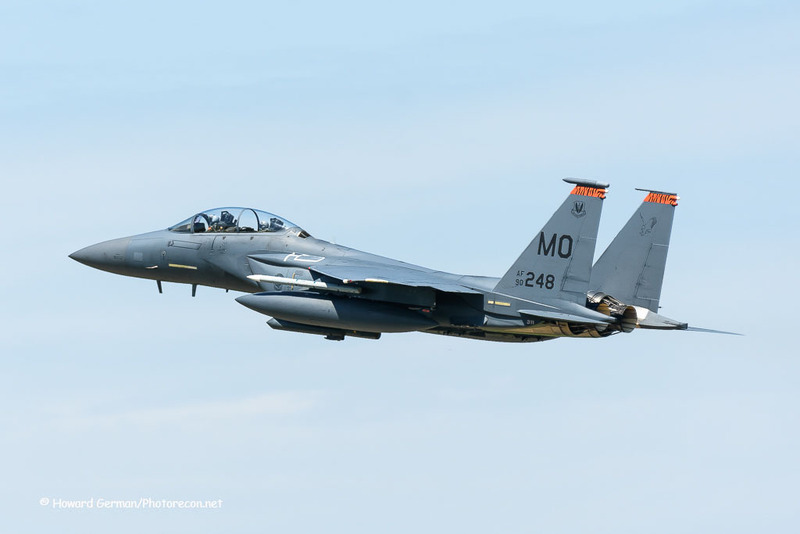 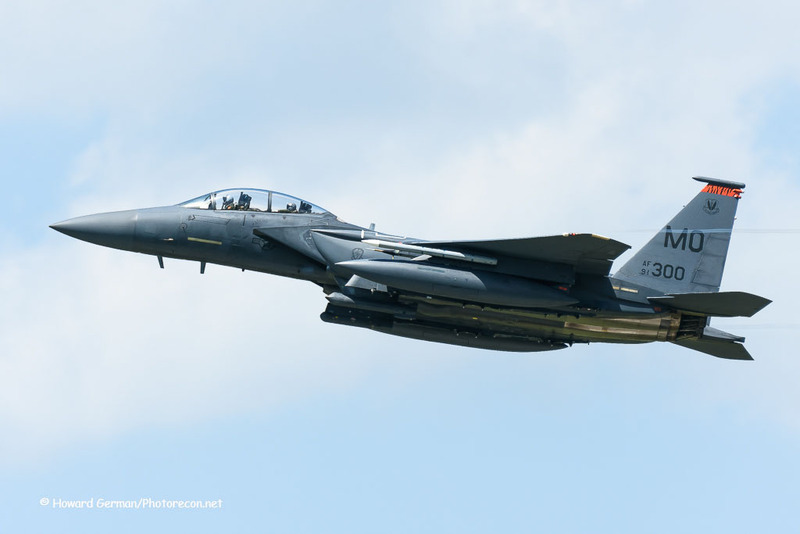 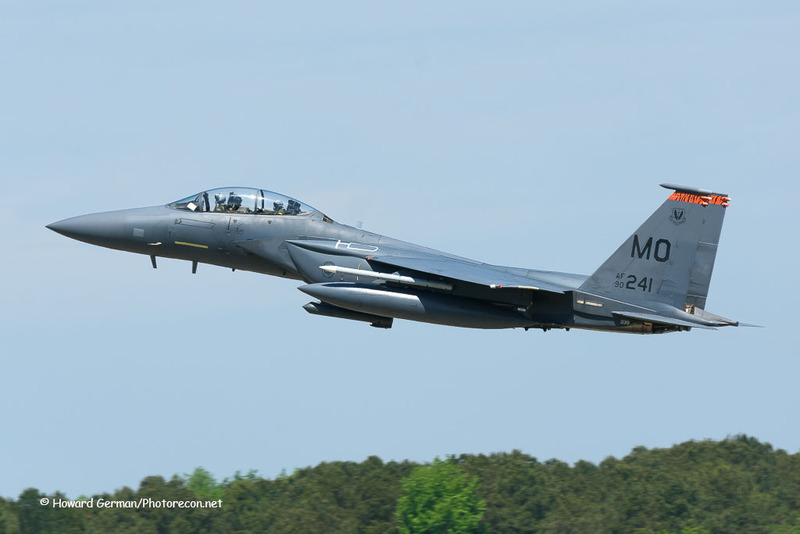 Playing the part of “Red Air” – the enemy – were F-15E Strike Eagles from the 366th Fighter Wing, and T-38Cs from the locally-based 71st Fighter Training Squadron. 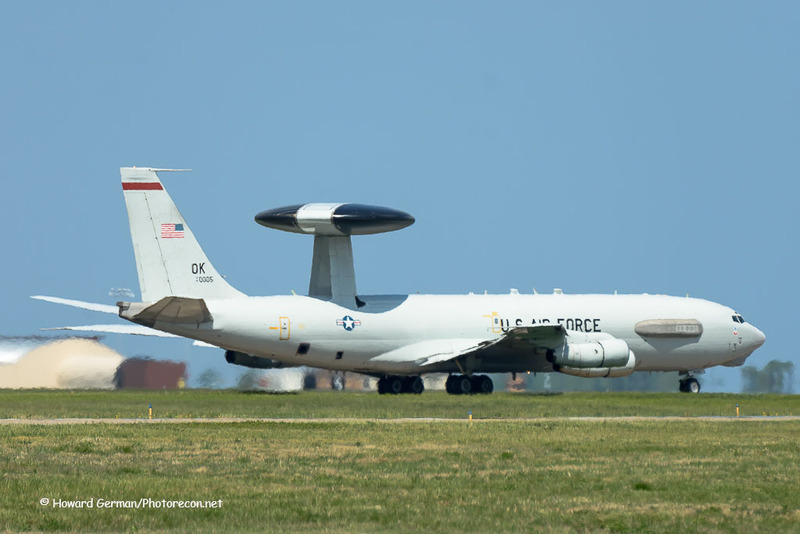 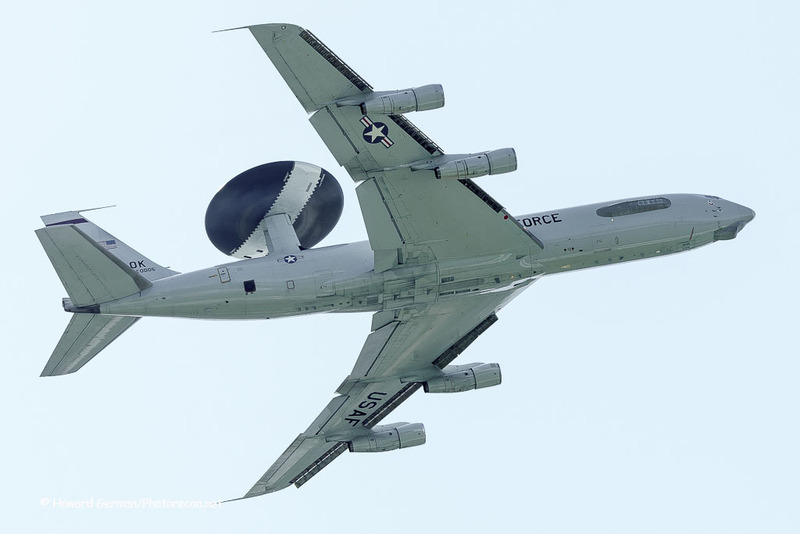 Air Force E-3 Sentry AWACS also participated, controlling the airspace used during each mission. 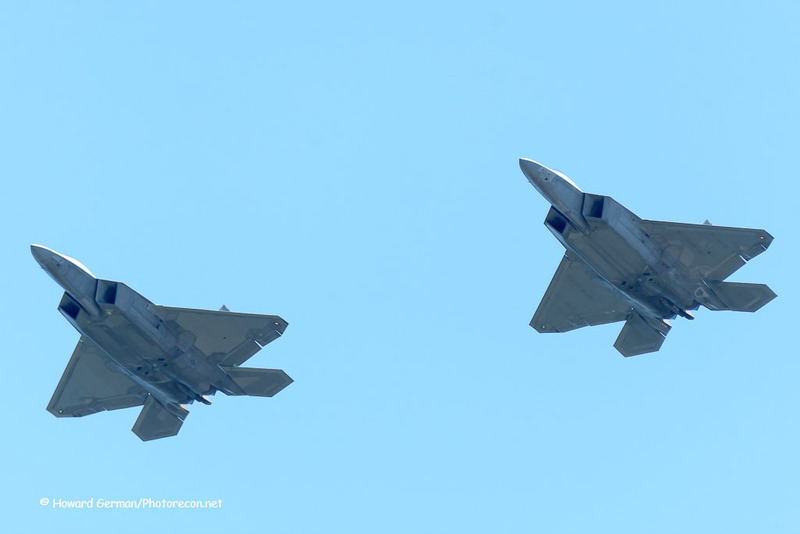 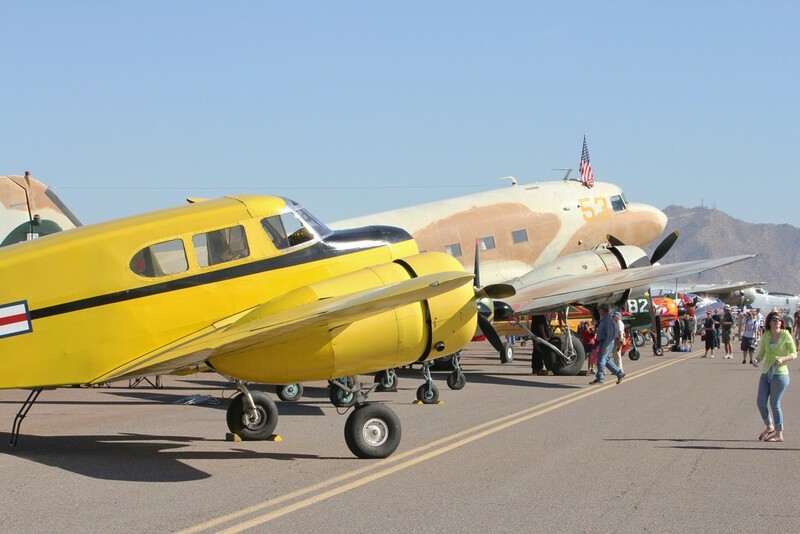 One or two full-scale missions took place during week days, involving up to thirty aircraft at a time. 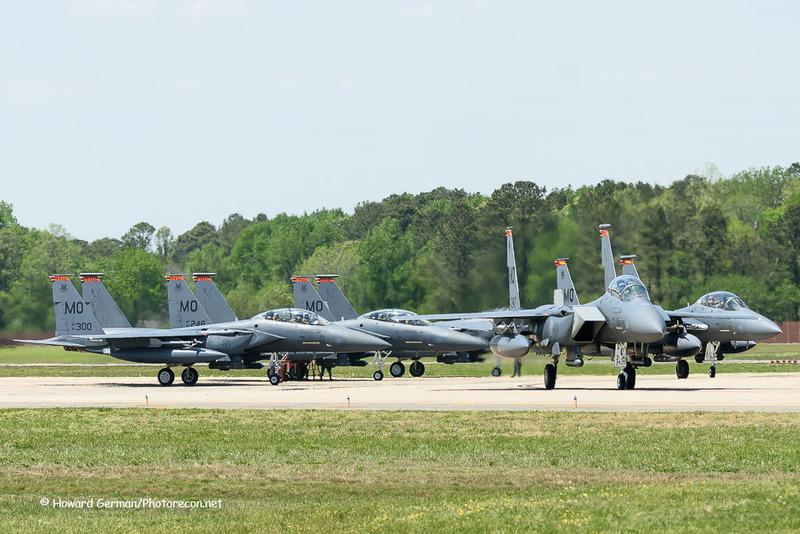 A special bond between the three air forces was celebrated on Friday, April 21, 2017 as Commemoration Day at Langley marked one hundred years of interoperability between the three countries, as on April 6, 1917 the U.S. entered into World War I on the so-called Allied side. 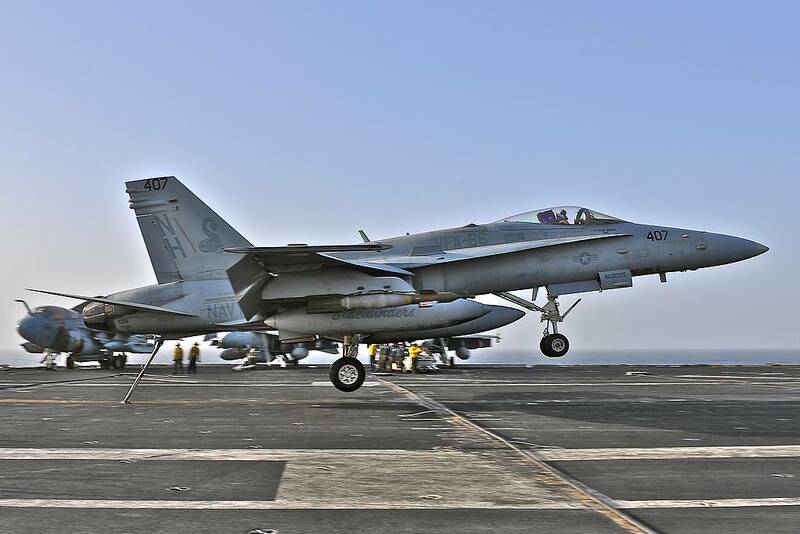 Some say that America’s entry decided the outcome of the war immediately, although it took another year and a half for hostilities to cease. 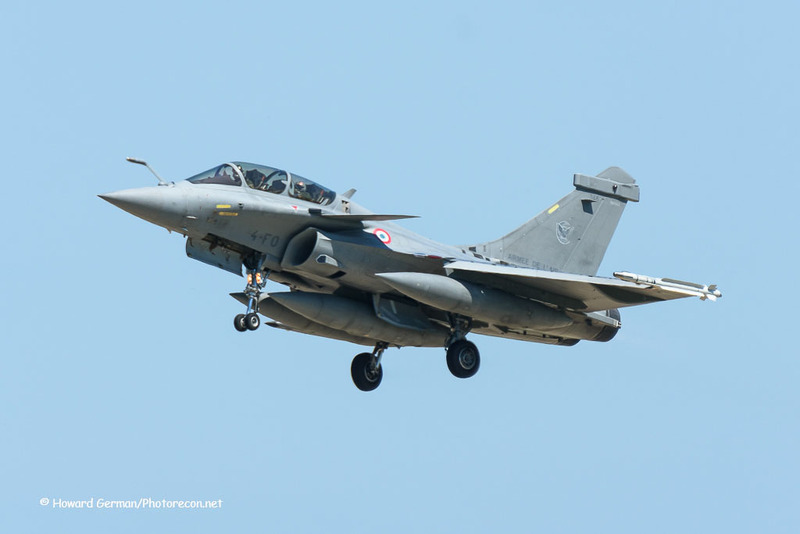 The French and British aviation arms initially trained American aviators and supplied European-built aircraft for the U.S. to utilize in the struggle. 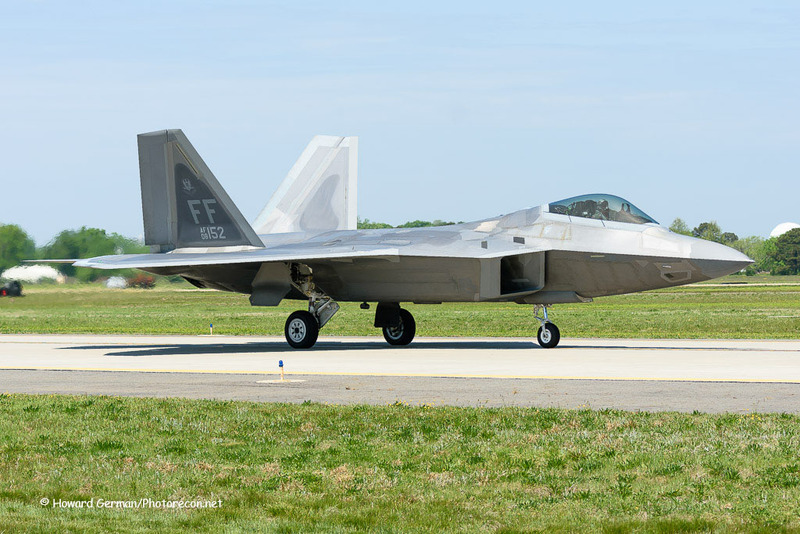 To celebrate the day, three early morning flight demonstrations were given by the F-22A Raptor, Rafale-C, and the Patrouille de France flight demonstration team. 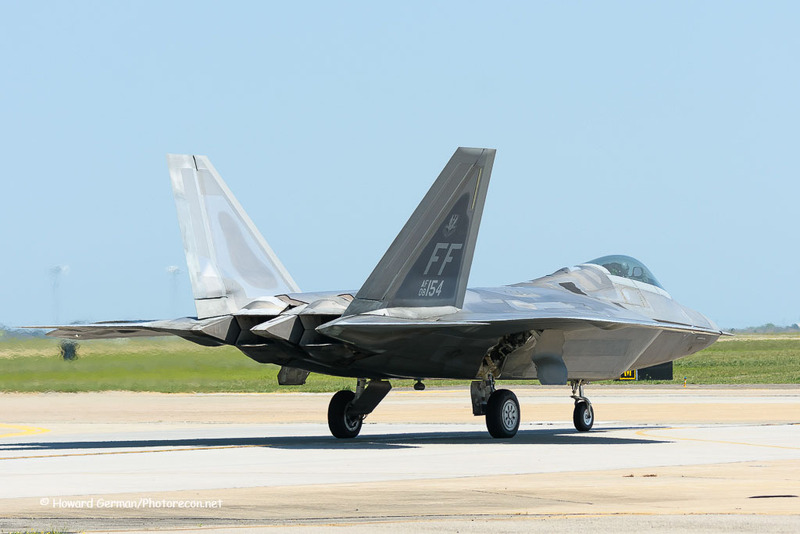 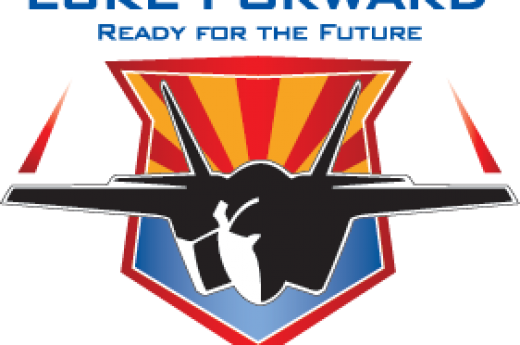 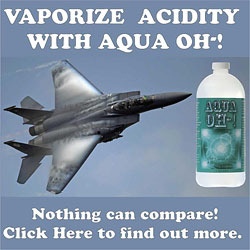 The Raptor was from the home-based 1st Fighter Wing’s Air Combat Command flight demonstration team. 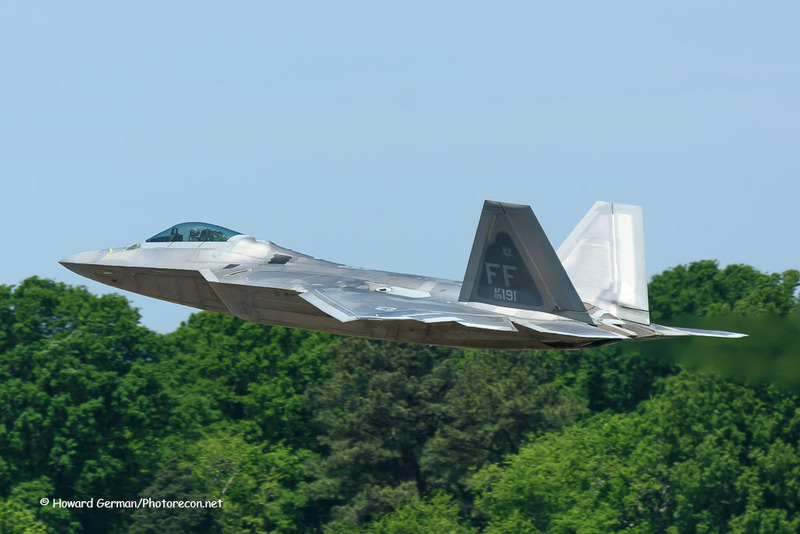 Powerful in the vertical and slow speed maneuvering realms, the Raptor showed off its muscles with glowing afterburners. 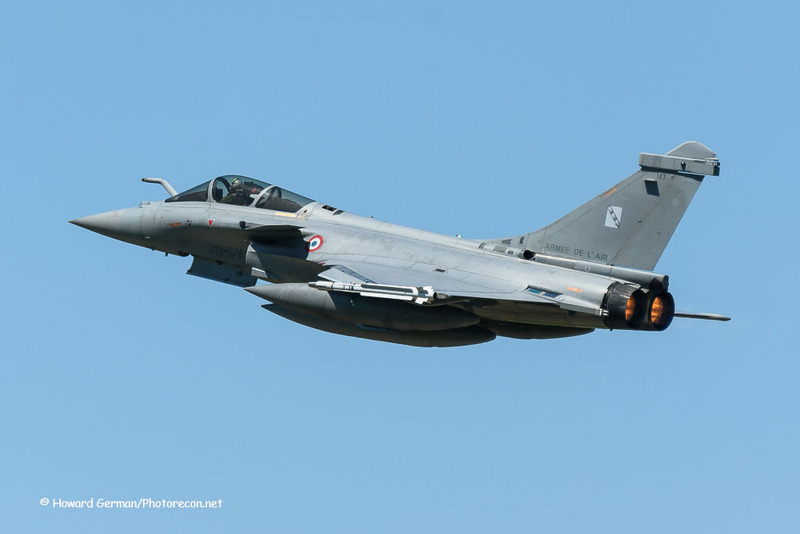 The Rafale is, as its manufacturer Dassault Aviation describes it, “Of a moderate size, yet extremely powerful, superbly agile and very discrete…”. 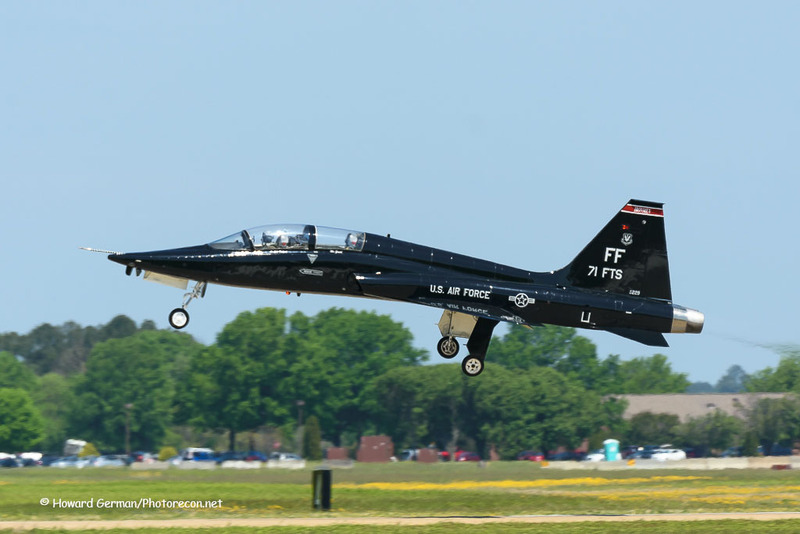 The flight routine presented to the assembled civilian and military representatives showed an elegant side of the jet, with many ballet-like rolls and turns that showed off the jet’s amazing maneuverability. 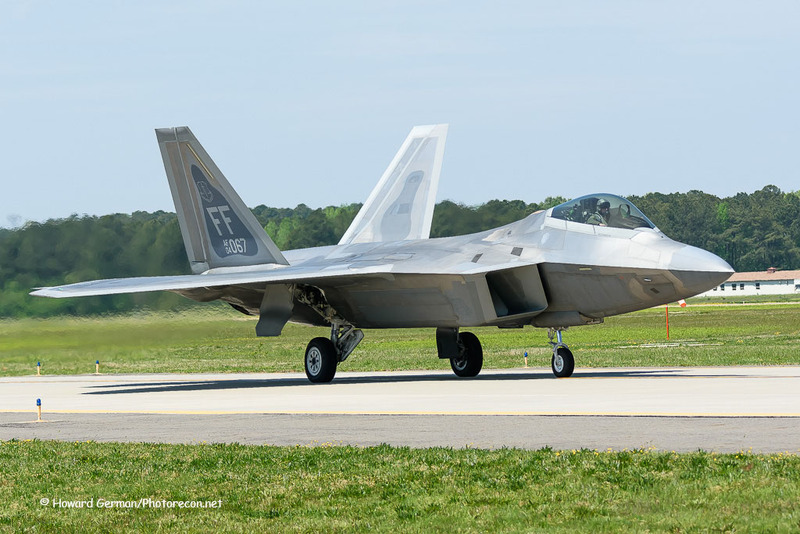 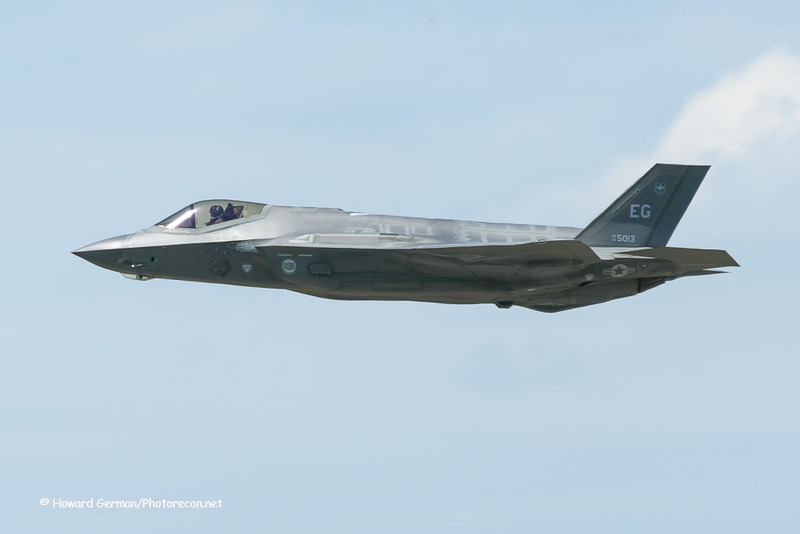 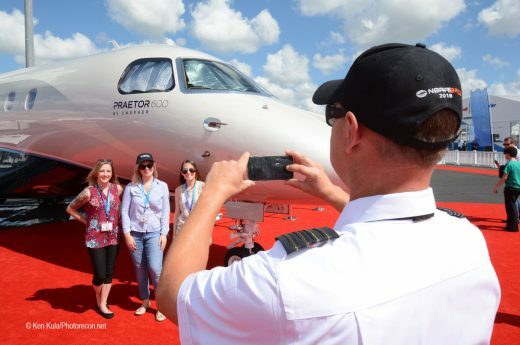 The capabilities may even have been understated, as the demo was flown in a constant, smooth path, not containing abrupt changes in attitude like the Raptor’s demo did. 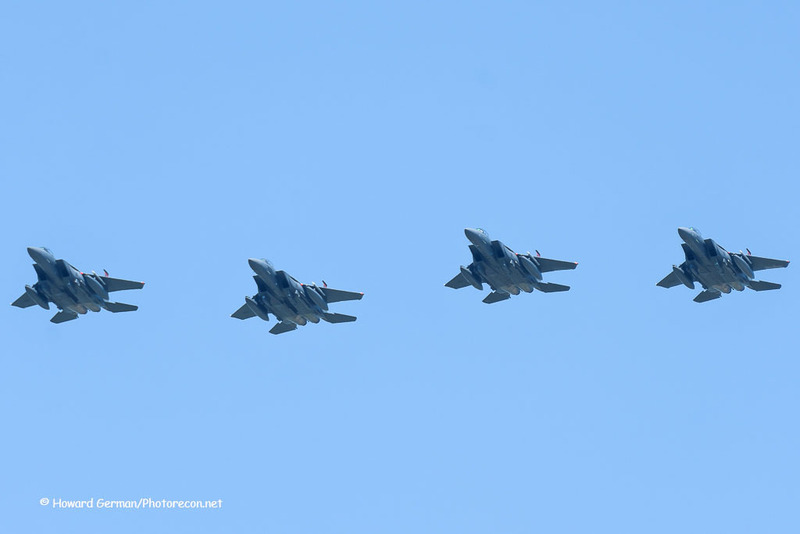 Finally, the Patrouille de France took to the warm Virginia skies, and trailed colorful red, white and blue smoke throughout much of their display. 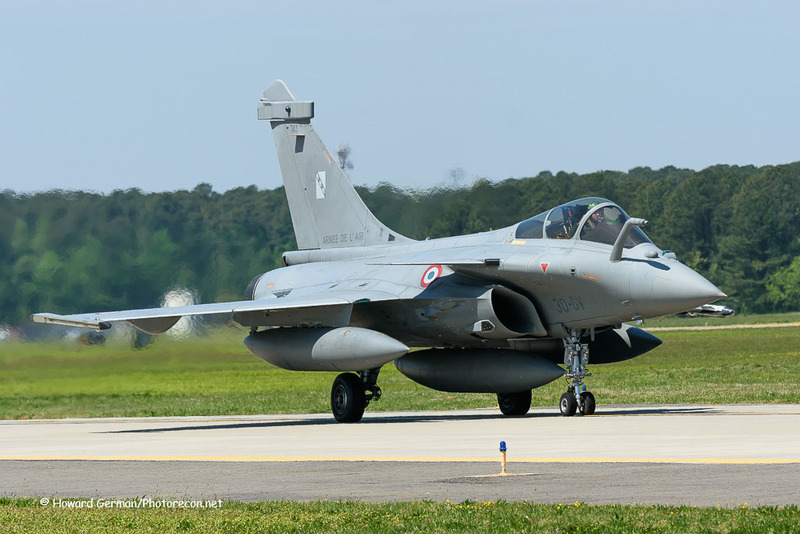 The big eight-ship formation was flown with finesse and grace like the Rafale, with a smooth flight path. 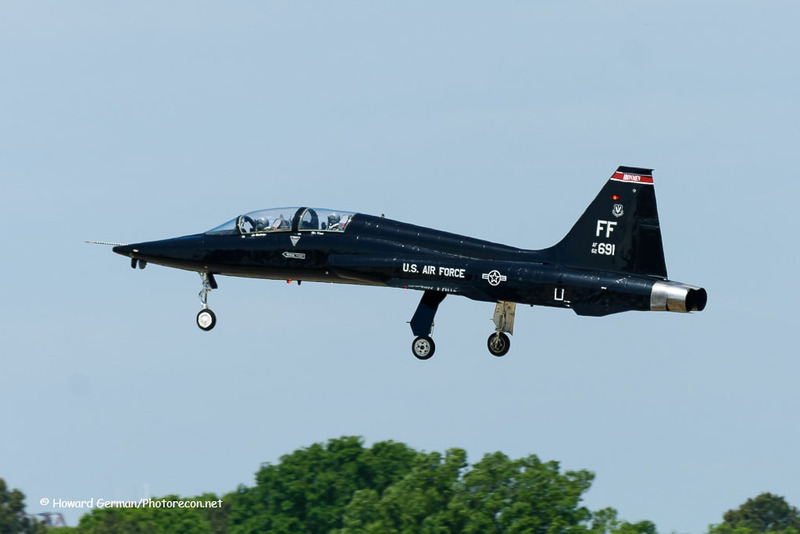 Later in their program, the group split into smaller units, and opposite direction passes by the two solo pilots finally showed a bit more of the of the maneuverability and power of their Dassault/Dornier Alpha Jets. 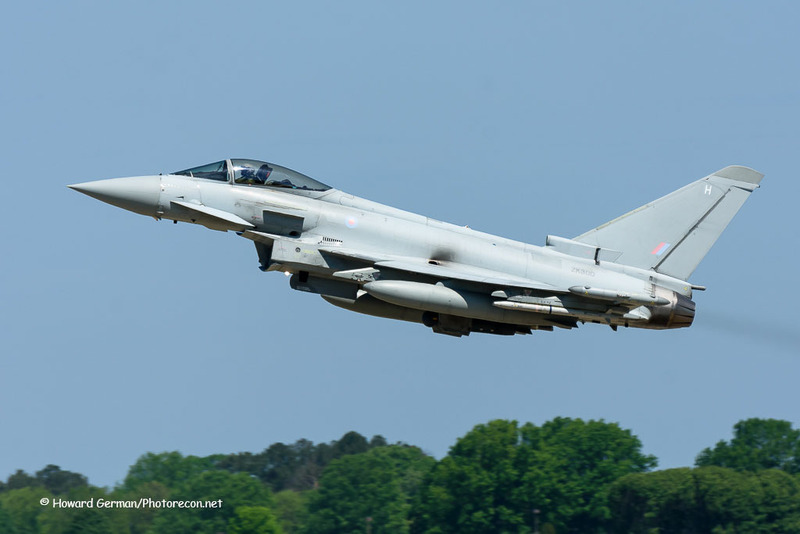 After a series of interviews with some of the exercise pilots and a tour of some static examples of the Atlantic Trident 17 aircraft participants, the departure of the day’s one full flight mission occurred. 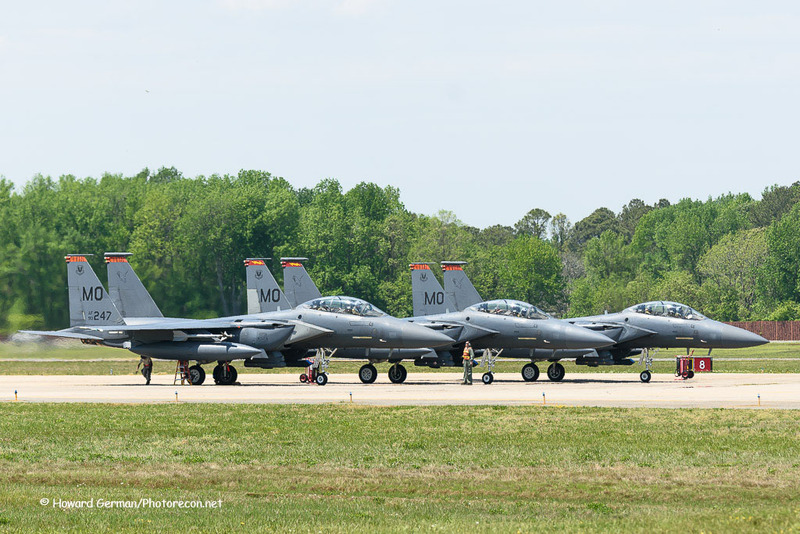 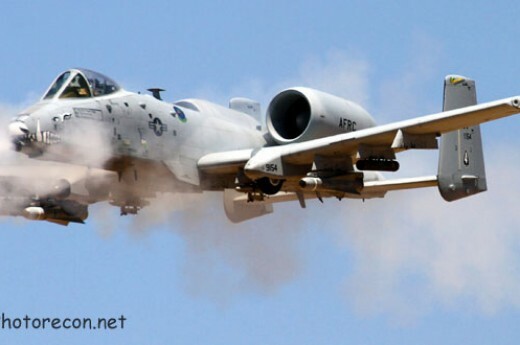 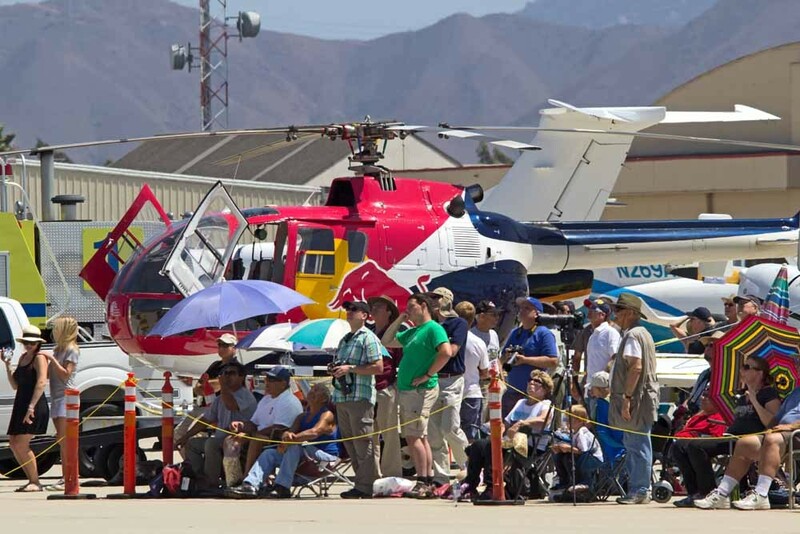 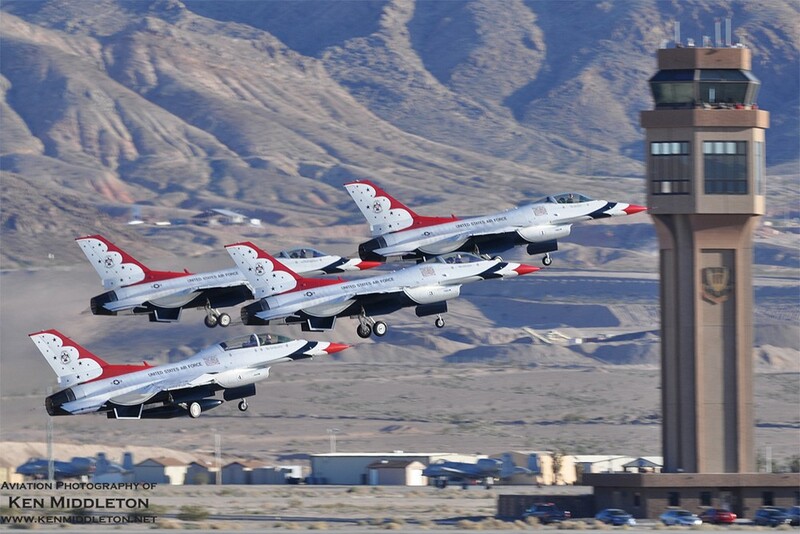 More than two dozen aircraft were launched within forty-five minutes, departing low down the runway, then making a climbing right turn up and towards the exercise airspace. 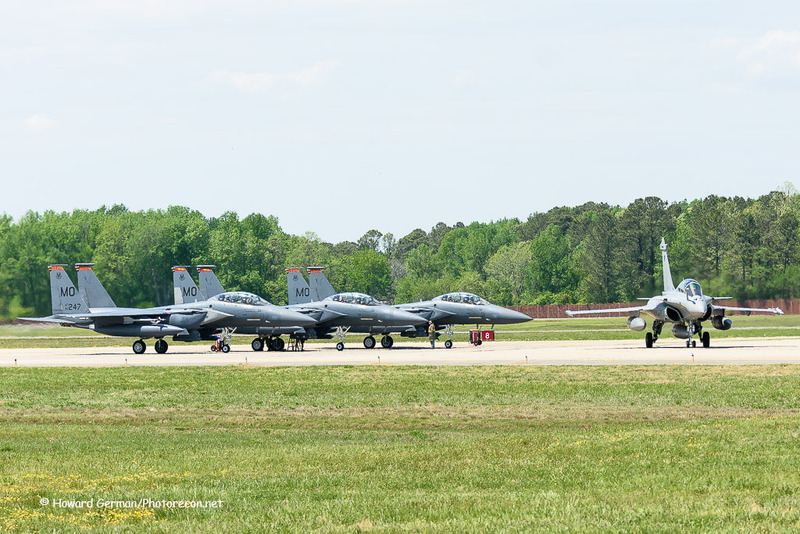 Many, but not all of the jets used afterburners for their departures, as the day began heating up towards the high of 88 degrees F.
The units that participated in the exercise this year shared lineages that dated back to World War I. 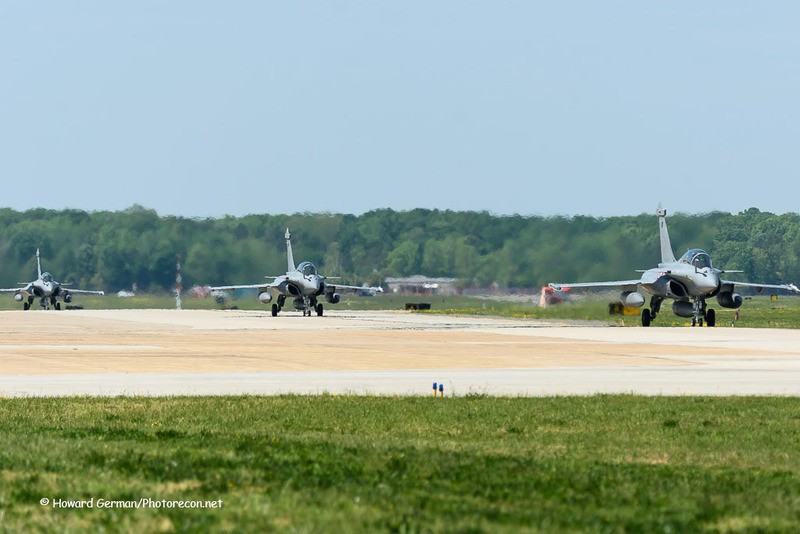 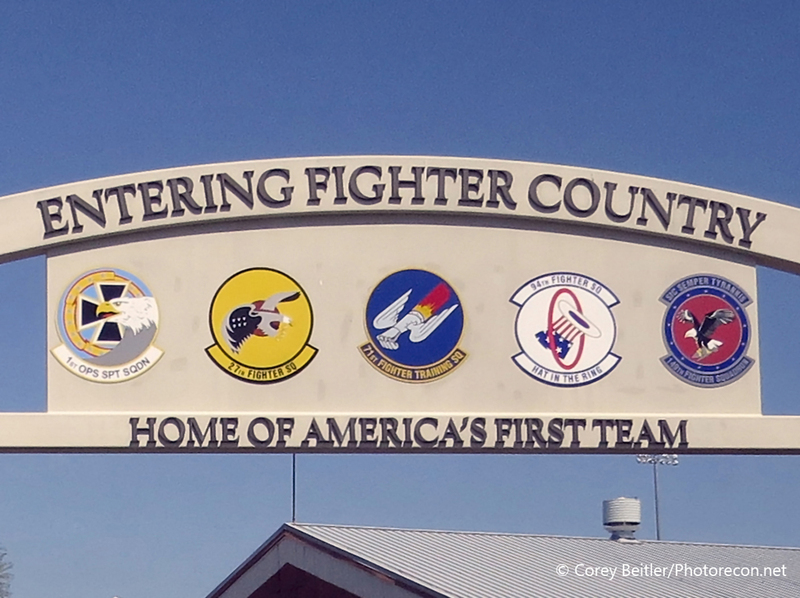 The 1st Fighter Wing’s 94th and 27th Fighter Squadrons are direct descendants of Aero Squadrons from the U.S.’s 1st Pursuit Group, which was the initial U.S. fighter unit to enter the War. 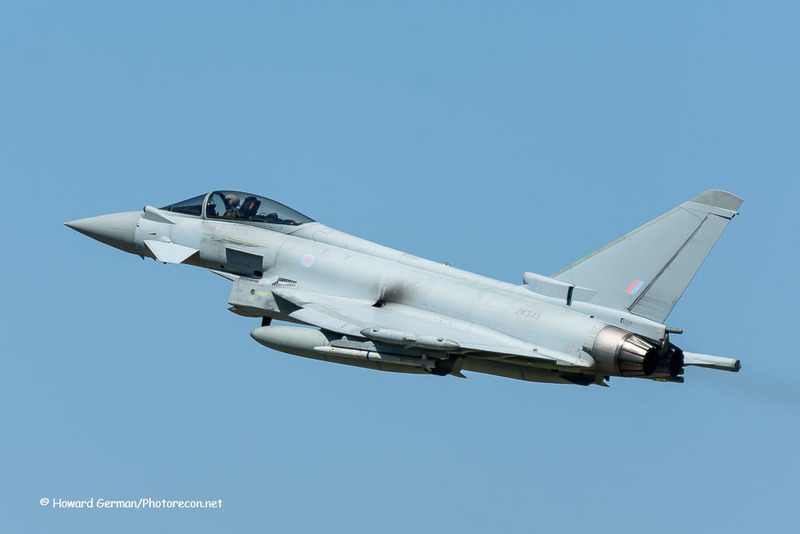 RAF Typhoons were from 1 Squadron, the RAF’s oldest unit and active before World War I. 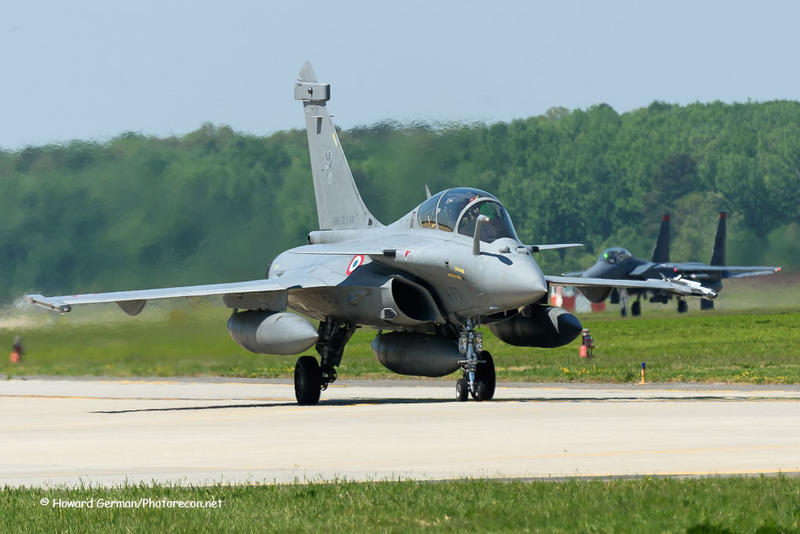 Many of today’s Armee de l’Air squadrons have links to World War I escadrilles too. 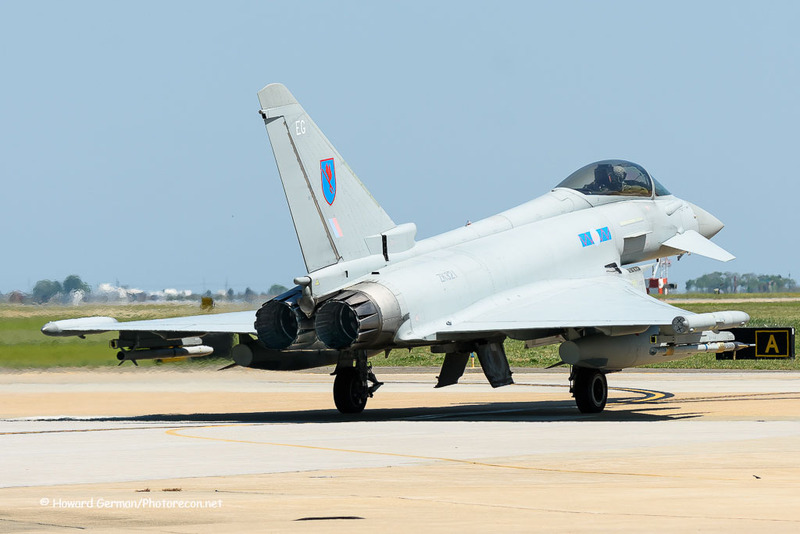 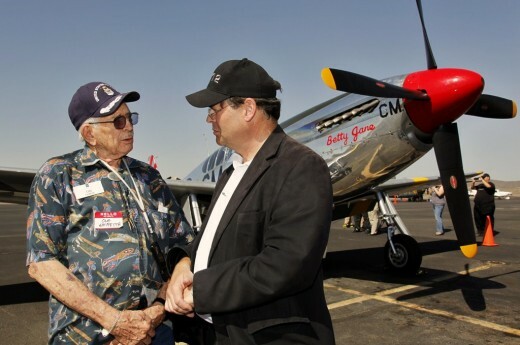 For a hundred years, French, British and American aviators have fought side by side in various conflicts around the world. 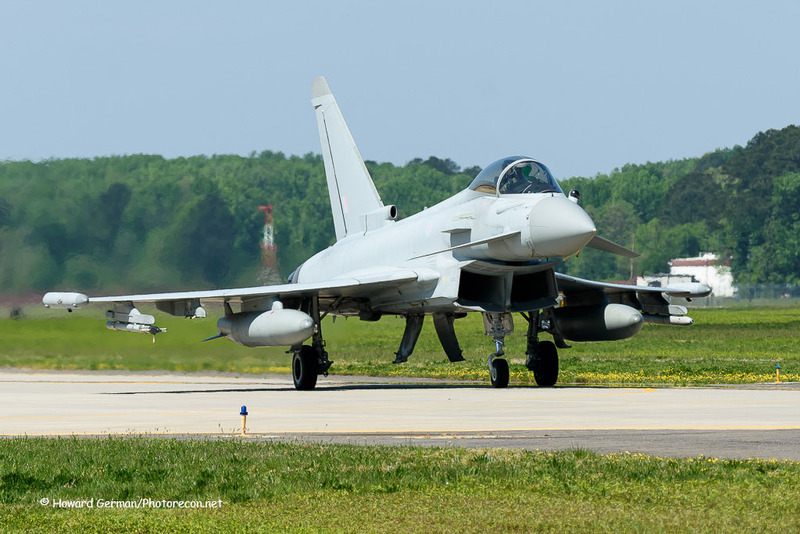 The main purpose of the Atlantic Trident 17 exercise was to improve interoperability between the three nations. 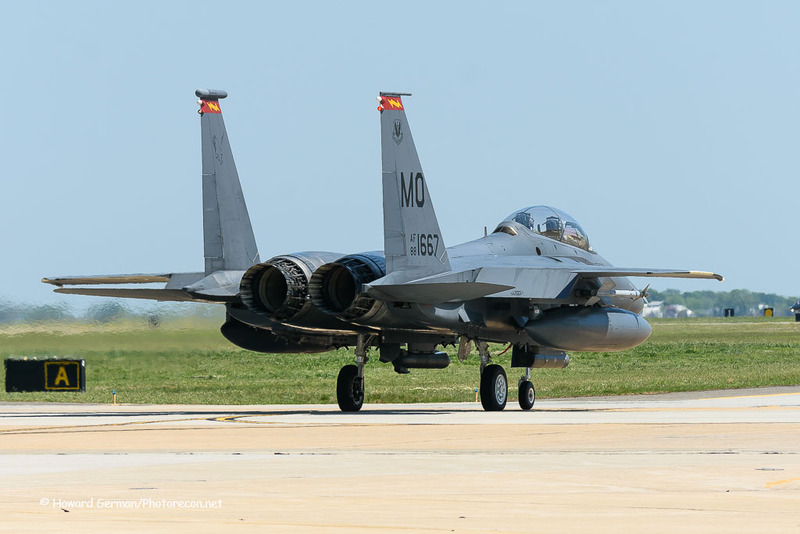 This year, it also offered an opportunity to mark this century of cooperation between friends, and a special commemoration of the U.S.’s entry into World War I. 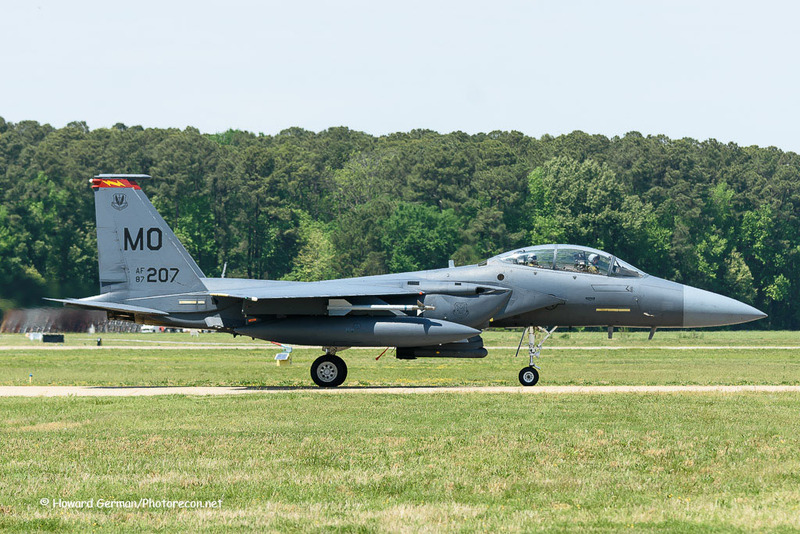 Special thanks need to go out to… Mr. Jeffrey Hood, Media Operations Section Chief, 633rd Air Base Wing Public Affairs, Mr. Joshua Lashley, 1st Fighter Wing Historian, and the men and women of the U.S. Air Force, Armee de l’Air, and Royal Air Force for taking the time to talk with us about current events and history during the Commemoration Day media event.